Many polymers do not break under flexure even after a large deflection that makes determination of the ultimate flexural strength impractical for many polymers. In such cases, the common practice is to report flexural yield strength when the maximum strain in the outer fibre of the specimen has reached 5 percent. The flexural specimen is comparatively easy to prepare without residual strain. 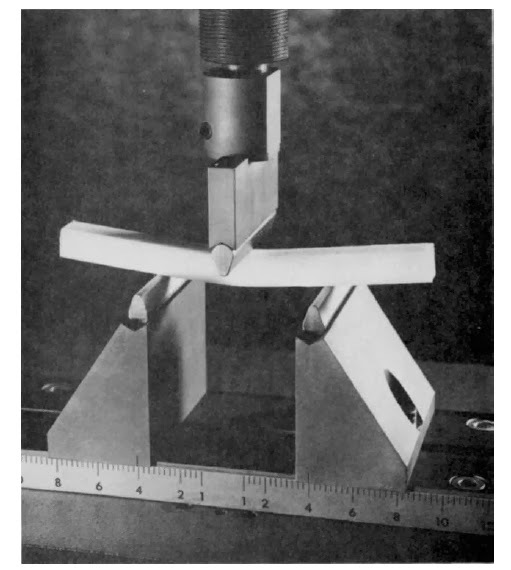 The specimen alignment is also more difficult in tensile tests. Also, the tight clamping of the test specimens creates stress concentration points. One other advantage of the flexural test is that at small strains, the actual deformations are sufficiently large to be measured accurately. There are two basic methods that cover the determination of flexural properties of plastics. Method 1 is a three-point loading system utilizing centre loading on a simple supported beam. A bar of rectangular cross section rests on two supports and is loaded by means of a loading nose midway between the supports. The maximum axial fibre stresses occur on a line under the loading nose.